Today is the day when I can share some good & bad news with you! 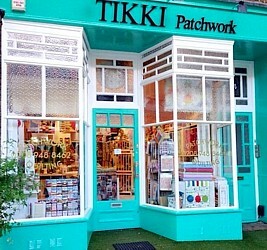 Tikki London shop in Kew Gardens will be CLOSING DOWN in May. It is very much for personal reasons that I will be closing a thriving business - my husband has today been appointed to a new international job, so we have made the tough decision to relocate lock, stock & barrel to Singapore. 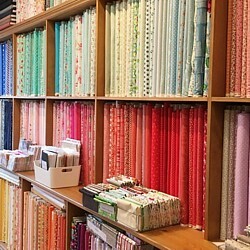 It is sad to part with my lovely patchwork shop, but being on the other side of the globe is simply too far to be able to run a business in the UK. Mixed with sadness is excitement & I'm looking forward to new adventures. I am also thankful to now be able to spend more time with my daughter & support her when she will be joining sixth form in a new school in Asia. And it will be lovely to have more time to sew & travel as well. So, the GOOD NEWS is that there will be a massive closing down SALE - everything must go! Give us the code " farewell " and we will give you 50% off all your shopping. Ps. just wadding is outside this offer for the simple reason that we have hardly any left & the last of the minimal stock is reserved at normal price. 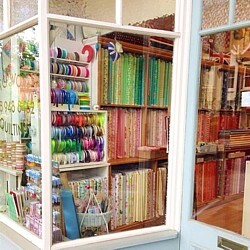 but it will be a busy time, so please bear with us and allow time when visiting the shop. Please check at tikkilondon.com before travelling - there will be changes and we will be closed over Easter Holidays. Royal Mail has increased prices yet again and as we anticipate larger orders due to the sale, we have a new fixed price rate for UK at �3.50. Please share our sale news with your sewing friends and please feel free to re-post on social media. THANK YOU to ALL our customers who have shopped with & supported Tikki during the last 12 years and to my lovely staff, past & present for loyally being there & helping out.